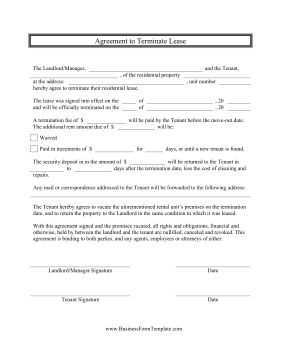 Tenants who want to terminate leases for their apartment and rental units can use this free printable contract to fill out with their landlords. Sections are provided for the move-in and out dates, as well as termination fees and security deposits. The Landlord/Manager _____, and the Tenant, _____, of the residential property at the address: _____, unit number _____ hereby agree to terminate their residential lease. The lease was signed into effect on the _____ of _____, 20_____ and will be officially terminated on the _____ of _____, 20_____. A termination fee of $_____ will be paid by the Tenant before the move-out date. Paid in increments of $_____ for _____ days, or until a new tenant is found. The security deposit in the amount of $_____ will be returned to the Tenant in _____ to _____ days after the termination date, less the cost of cleaning and repairs. The Tenant hereby agrees to vacate the aforementioned rental unit's premises on the termination date, and to return the property to the Landlord in the same condition in which it was leased. With this agreement signed and the premises vacated, all rights and obligations, financial and otherwise, held by between the landlord and the tenant are nullified, canceled and revoked. This agreement is binding to both parties, and any agents, employees or attorneys of either.